The much-anticipated riverside precinct finally opens on Friday. Here’s what to expect. Ku De Ta executive chef Dan Fisher and head chef Liam Atkinson. First things first, check your preconceptions about Ku De Ta at the door, at least if you’re expecting to find a carbon copy of the Seminyak beach club at Fraser Point on the eastern edge of the CBD. 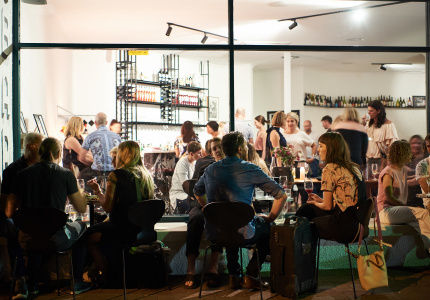 That’s not to say Ku De Ta Perth doesn’t have things in common with its Bali mothership. Both venues overlook the water. Both venues sport a combination of indoor and outdoor areas. 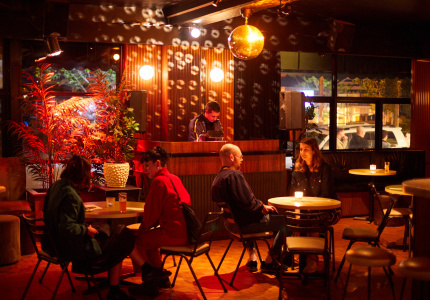 Both venues lean heavily on DJs for entertainment purposes. 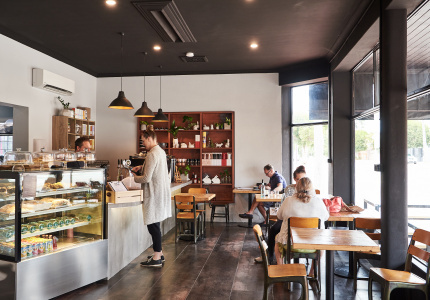 But whereas the Indonesian original is calibrated to holiday fun-in-the-sun, the Perth expansion is about the urban and urbane, from the fit-out of the space to the utterly contemporary cooking. 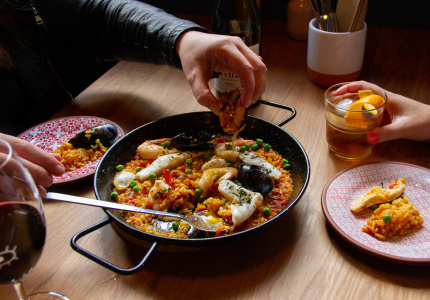 “There’s no nasi goreng on the menu,” says head chef Liam Atkinson, a local cooking journeyman that has worked in the kitchens of Star Anise, Miss Kitty’s Saloon and, more recently, the Print Hall Dining Room. 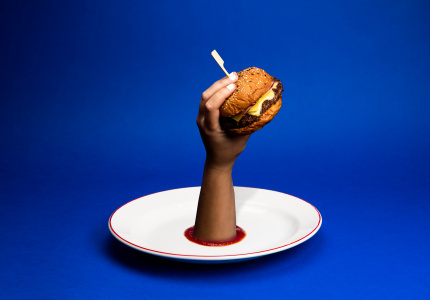 It was at his last posting that Atkinson met Dan Fisher, Ku De Ta’s executive chef and, among other things, a former sous chef at Sketch, the London restaurant opened by wildly creative French chef Pierre Gagnaire. 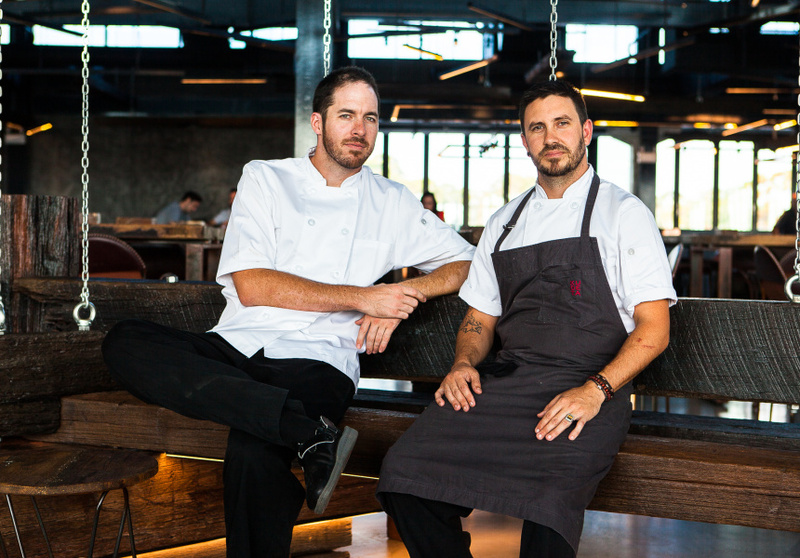 For the past eight months, the pair has been working on the food across Ku De Ta. 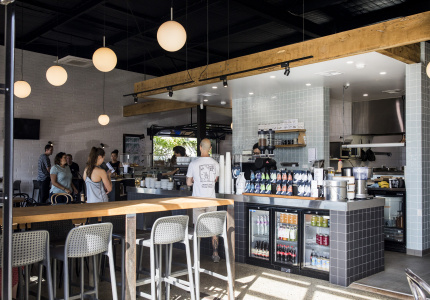 As far as upsides to Ku De Ta’s opening delays go (the venue was scheduled to open in November), one might point to Fisher and Atkinson having more time to scour the land for ingredients as a pretty handy piece of silver lining. “We’ve had a lot of time up our sleeve, so have tried to use it to find these small producers around the state and get our hands on some really cool produce,” says Fisher. 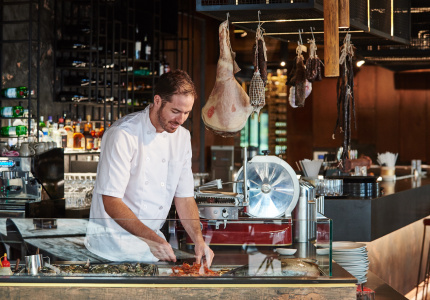 With three venues making up Ku De Ta Perth, the pair will have plenty of opportunities for satisfying cooking impulses. 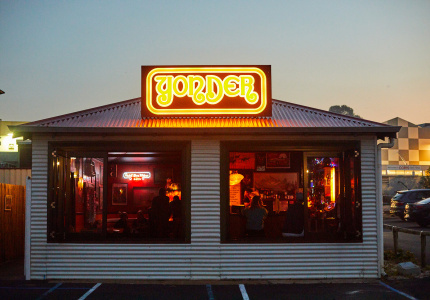 (That all three venues are open for dinner, meanwhile, will be welcome news to diners). The first to open will be The Deck, a casual diner-slash-bar that serves breakfast until midday before switching to an Italian menu for the rest of the day. The pasta is made in-house (hot tip: go the bigoli carbonara served with duck egg and the Japanese-y crab pasta hit with nori and furikake) while pizzas are baked in a Pavesi oven: the same oven used by cult Brooklyn pizzeria, Roberta’s. 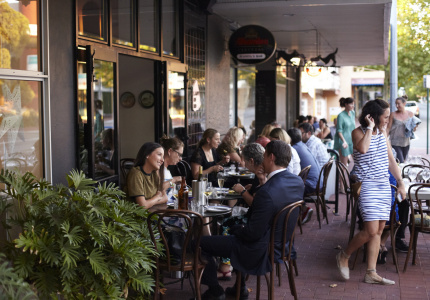 The following week sees Ku De Ta welcome guests to its two other venues: seafood and charcuterie bar, West (you’ll never guess which side of the building it’s on) and Ku Dining, the most ambitious of the precinct’s dining options. The chefs are quick to stress it isn’t a fine diner, but rather the “premium” dining option and something that is “distinctly West Australian”. West opens next Wednesday with Ku following closely behind on the Friday. 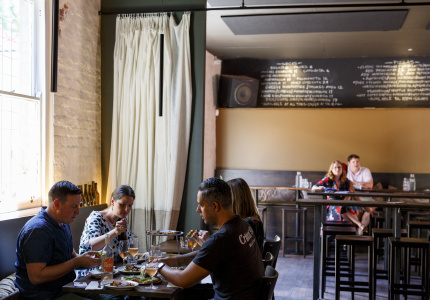 Both venues will share a larder of predominantly West Australian ingredients only, with the dishes stripped back at West. At the wine bar, for example, the beef offering is minute steak with shimeji mushrooms and Café de Paris butter. At Ku, it’s wagyu skirt accompanied with fermented broccolini and olive leaf. 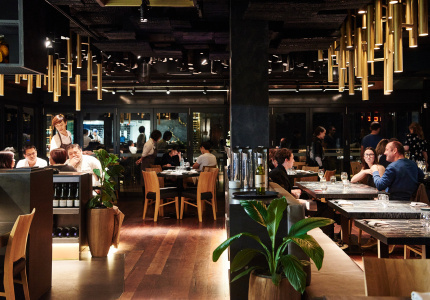 Other items on the opening menu that caught my eye include duck egg with smoked bone marrow and XO sauce and marron with a saltbush bearnaise (Ku Dining) and crab sandwiches and platters of all-Australian charcuterie and cold cuts at West. The drinks side demonstrates similar attention to detail. 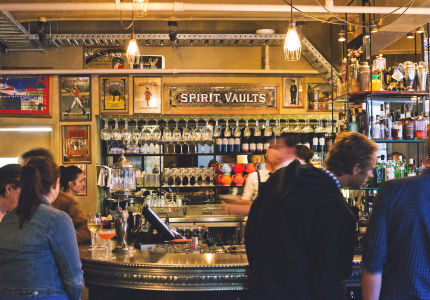 Gun bartender Jo Sinagra (late of Bobeche) is overseeing all things cocktail while Ian Baverstock, last seen at Rockpool Bar & Grill, is consulting on the wine list. 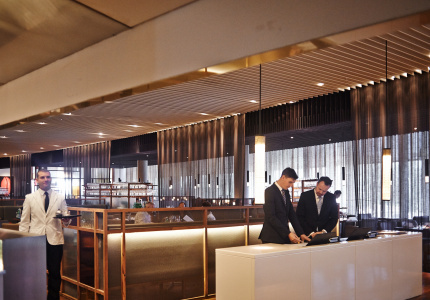 Fellow Rockpool alumus Jeremy Burt has joined the opening team at Ku De Ta as general manager. 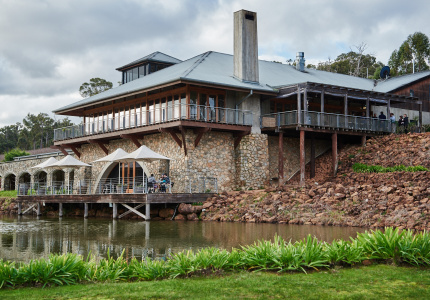 Aesthetically, London-based architect Perparim Rama has dug into the site’s history and designed a space rich in timber, stone, natural light and views of the Swan River. Like we were saying, check your preconceptions about Ku De Ta at the door. Ku De Ta is at 306 Riverside Drive, Perth and opens on Friday March 17.